Workshop 17 & 18 mai 2018, salle Dussane, École normale supérieure, 45, rue d’Ulm, 75005 Paris. Ekaterina Svirina (Higher School of Economics, National Research University) ‘Variety of money in Siberia in the 18-19th century’. No one would deny that money is a means of exchange. However, historically, exchanges between people have had different characteristics, and the devices used to mediate those exchanges (i.e. money, as a means of exchange) have reflected those characteristics. All exchanges have two, binary characteristics. The first characteristic is the degree of familiarity of the participants : an exchange can either occur anonymously or within a named relationship. As we use this term, the degree of familiarity does not refer to whether a seller and a buyer are acquaintances or strangers, but rather to whether or not the act of making a transaction creates a bond that constrains subsequent transactions. The second characteristic of an exchange is its distance : a trade can be made either proximately or distantly. By distance we do not refer simply to physical distance, but rather to the size of the value of the exchange and its frequency. Proximate exchanges tend to be of small value and to be made more frequently than distant ones. In addition, in agricultural societies, the former is more affected by seasonality than the latter. All exchanges have these binary characteristics of familiarity and distance. There are, therefore, four different kinds of exchanges, which we can represent with four quadrants. People in societies have tried to make different devices to mediate all four kinds of exchanges. A typical case appears in the figure below, in which large currency is used for anonymous/distant exchanges (Quadrant I), bills of exchange for named/distant exchanges (Quadrant II), book keeping for named/proximate exchanges (Quadrant III), and small currency is used for anonymous/proximate exchanges (Quadrant IV). In reality, the four Quadrants seamlessly cover all exchanges, and a given device thus may mediate exchanges characterized by one Quadrant in one context only to function later in a different Quadrant. For example, bills of exchange that were initially characterized by Quadrant II sometimes could function as currencies in Quadrant I or even in IV. The boundaries demarcating the different Quadrants are also not of uniform clarity. The distinction between Quadrants II and III is fuzzy, while there is a considerable difference between the sporadic exchanges that characterise Quadrant I and the constant exchanges of Quadrant IV. 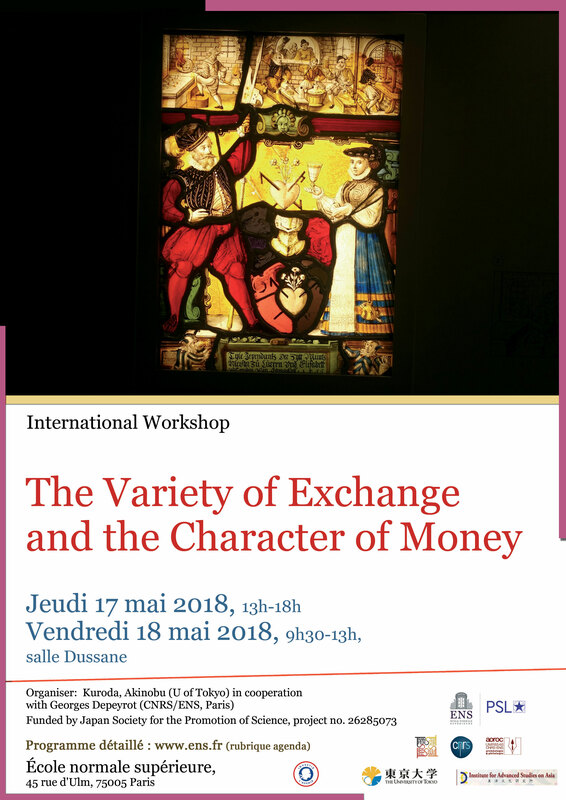 Making comparisons that cover practically the entire globe, this workshop aims to reveal the variety of ways in which the four Quadrants can be combined, to trace the trajectories of their transformations, and to subsequently indicate why money cannot be easily unified.